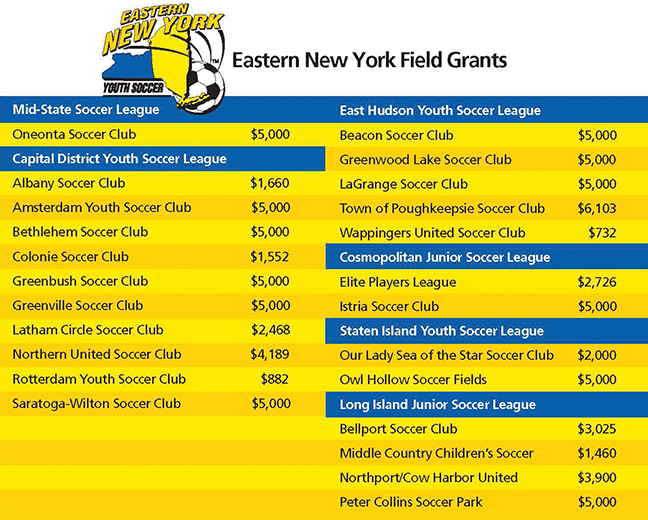 March 13, 2019-During the past year, the Eastern New York Youth Soccer Association (ENYYSA) has donated nearly $100,000 to 21 clubs in six member leagues as part of our Field Maintenance Grant Opportunity. “Eastern New York is very pleased to provide these grants to organizations throughout our geographic area that is being used for the upkeep of their fields and will help make the upcoming Spring Season go more smoothly,” commented ENYYSA President Richard Christiano. "The Town of Poughkeepsie Soccer Club would like to thank Eastern New York for their great support of our organization by providing us with $6,103 in grant money," said Town of Poughkeepsie Soccer Club President Bo Demczar. "With these funds, we've been able to improve our fields by helping to secure 12- to 15-foot benches for many of our playing fields as well as get additional dirt to level parts of our soccer complex. We could not have made these changes to our fields without the generous Eastern New York support!"